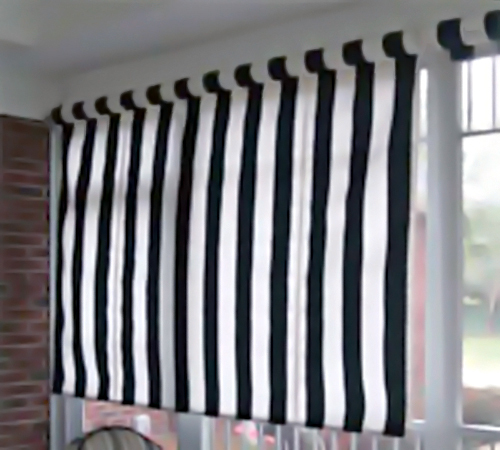 Please note that the cranking roll-up bar is the actual width of each curtain but that the fabric covering is 3.75" less than the width of the roll-up bar or 1.875" per each side. As an example a 6' curtain would have a 6' roll-up bar and a 68.25" wide fabric covering. Exterior or Porch Window Roll Up Window Shades in Sunbrella Fabrics with Manual Hand Crank or Motorized option available in a tight weave Sunbrella canvas which is opaque. The tight weave Sunbrella fabric is what the majority of awnings, retractable patio awnings and door canopies are made from and comes in over 120 different colors and patterns. Having these color choices make it easy to color coordinate every shade structure on your home from the roll up porch curtains to window awnings to a retractable patio awning. These eye-catching roll up curtains are also built to last incorporating a roll up tube at the top of the shade plus an extruded aluminum mounting bar that is weather resistant. As an added convenience these window shades roll up with a manual hand crank versus a rope and pulley system or can also be motorized. All hardware is metal and not plastic plus these curtains incorporate the Gore-Tex Tenera weather resistant thread on all seams to help keep these roll up window shades intact and looking good for years to come. You'll find these roll-up widow shades are an ideal solution for over patio doors, exterior windows or windows attached to the front porch. These window shades can serve as a covering for a patio door, functioning as a sun block / privacy screen or can be used just about anywhere that you would like to cut back on the sun's rays. The real added bonus is that you will also find these window shades a very attractive exterior accent to your home on top of reducing the sun's harmful rays and reducing your cooling bills. Just a note about the Sunbrella Tight Weave Fabric; Sunbrella Tight Weave Fabric: Filters out 94% of UV rays and does not allow light through and is water repellent. This fabric offers the look and feel of canvas but has the durability of acrylic and carries a 5 year warranty. Please e-mail to AwningsCenter@Yahoo.com or use the contact form to request quotes on custom sized roll-up Window Shades.